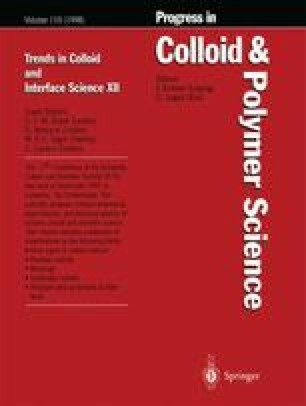 The synthesis of colloidal silica spheres grafted with long poly-(dimethyl siloxane) chains as described in literature has been successfully reproduced. The particles have been elaborately characterized, using different techniques and taking advantage of the availability of the unreacted bare particles and free polymer. Rheological measurements were performed on dispersions in heptane, all made from a single stock. An effective volume fraction was defined, based on the viscosity at low concentrations. Low shear viscosities and linear viscoelastic properties were measured at effective volume fractions up to 0.81. A transition from liquid-like to solid-like behavior is observed at φ ≅ 0.60. Up to this volume fraction, the particles behave much like Brownian hard spheres. At higher concentrations, softness effects become noticeable. Here, also differences from otherwise comparable soft spheres become pronounced.